Working from home generally means juggling planning meetings and dinner plans, bottom lines and clothes on the line, client care, and childcare. When the holiday season rolls around, the multitasking multiplies even more as kids go on school break, houseguests arrive and event invitations flood the mailbox. Add in enticing distractions such as gingerbread houses and winter activities, holiday movie marathons and epic shopping excursions, and you may have a hard time focusing in the midst of all the fa-la-la-la-la-ing. Here, I’ve gathered some of my best tricks for staying on task this season without having to channel your inner Scrooge. While your office hours may typically fall during the morning or early afternoon, when kids and houseguests are demanding your attention, working during the day can be daunting. Try dedicating a couple of early hours before the rest of the house rises or setting aside time after everyone has gone to bed in order to complete your to-dos, freeing up the bulk of the day for time with loved ones. If you’re hosting overnight visitors, be honest with them about specific times when you’ll need to work — they may even appreciate the freedom to sleep in or venture out on their own. Need the kids contained so you can concentrate? Trade a play date with a fellow parent and gain a large chunk of time to get work finished. If your office shares the guest room, or if your desk resides in a heavily trafficked area of the house, you may need to temporarily shift your workspace to a different part of the home — preferably one that’s private and quiet. Consider converting your bedroom vanity into a virtual work world, or tuck a table inside a walk-in closet as a creative solution to an overrun office. I recommend investing in a rolling office cart so that you can easily transport the files and supplies you need from your regular desk to your transitory task zone. And who knows? The new location might give you a fresh perspective on the task at hand. Prioritize, and then politely decline. It’s not hard to get swept up in the spirit of the season, only to find yourself spread impossibly thin by commitments to charity causes, holiday parties, cookie baking, and festive events on top of your already hectic schedule. Before the onslaught begins, decide who and what is most important on your list this year, and then allow yourself to kindly say no to invitations and activities that aren’t in line with your priorities. By not over-committing, you’ll preserve time and energy for work demands, and you’ll be able to treat yourself to some needed downtime. To ensure that the time you do spend working is effective and efficient, put regulations in place that will help you resist the lure of online shopping. Stow any marketing mailers, flyers, and coupons, along with your credit cards, far away from your desk to avoid retail temptation while you’re at work. I also like to close my email inbox while I’m at my computer, lest my focus be frazzled by the endless stream of emails touting 30, 40, and 50 percent off my purchases. Once you’ve completed your work duties, feel free to dive into those distracting messages. Can’t resist taking a little buyer’s break in the midst of your workday? Give yourself a specific time frame in which to shop, and set a timer to be sure you don’t lose track. There’s nothing like a warm, winter atmosphere to jumpstart a jolly frame of mind and relieve some of the stress this time of year can bring. Whether it’s holiday music softly playing in the background, faux snow on your windows or a small Christmas tree adorning your desktop, there are plenty of ways to decorate without causing yourself too much distraction. For some quality time with the kids, ask them to help you festoon your office space with festive touches. 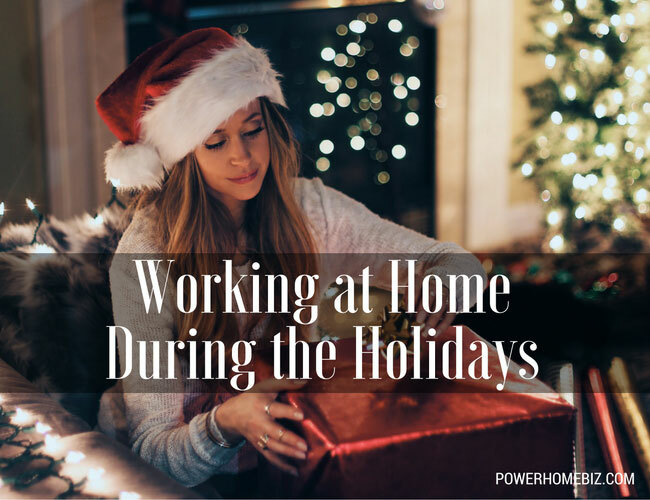 What tips do you have to make sure that merry and bright don’t dull your work from home during the holiday season? There’s No Place Like Working From Home: Get Organized, Stay Motivated, Get Things Done! Chris Long has been happily helping homeowners and small business owners as a Home Depot store associate in the Chicago area since 2000. Chris also writes tips and advice for Home Depot’s Home Decorators.com website. His interests range from home offices, furniture and rugs to kitchens, baths and family rooms.